This year I hosted my first House Party and it was a blast! 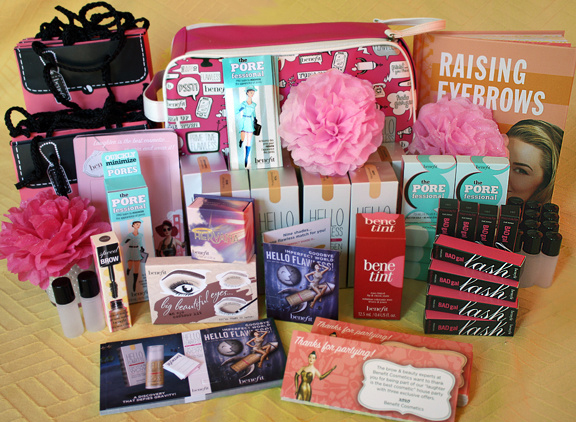 The party was for one of my favorite beauty brands, Benefit Cosmetics. I've been using the stuff since I first discovered Benetint about 15 years ago. I still love their quirky packaging and product names. They're too cute. I started working on these as soon as I found out I was selected as a hostess. Which was like a month before the party date. hee hee. I couldn't help it. I was excited! Miss Betty greeted guests on the porch so they knew they were in the right place, and later joined us inside for photos ops. 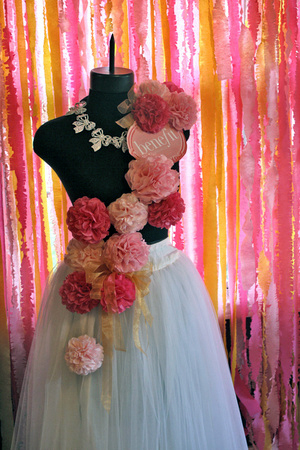 Along with a tulle skirt that was once a bridesmaid outfit, I dressed her up with frosted tissue paper roses, organza ribbon, a Benefit sign (which I downloaded from House Party) and some blingy yumminess. I wanted to create a pretty photo backdrop that incorporated the various shades of pink and yellow from Benefit's logo while covering up the yucky backyard. 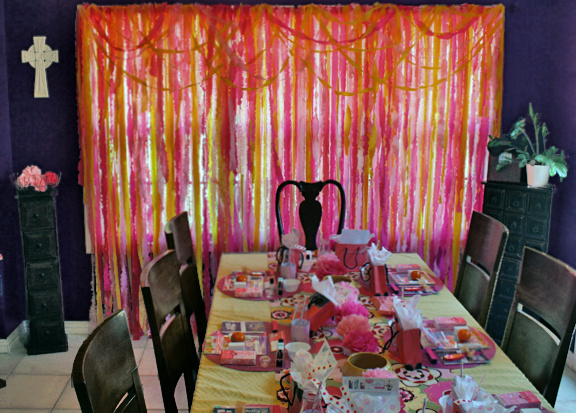 The streamer curtain completely transformed the room. Guests could see it as soon as they walked in the "salon" and it totally set the fun and frilly tone for the rest of the afternoon. Next were the makeup stations. The table was covered with a yellow tablecloth, a length of funky floral fabric and little votives with frosted tissue paper roses running down the center of the table. 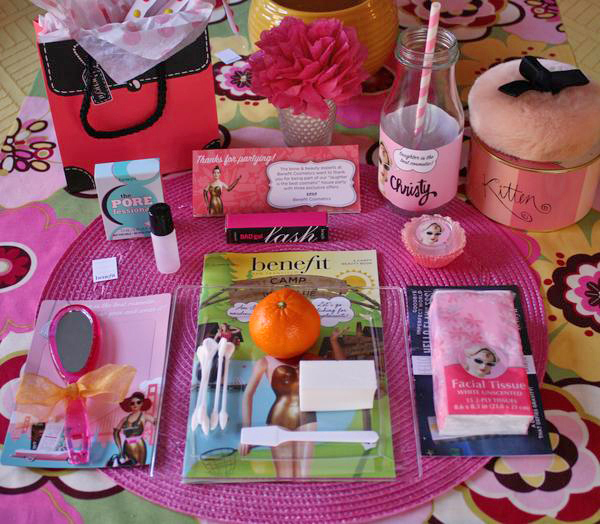 At each place setting, I set out all the Benefit goodies including little pink mirrors from Party City and drinking glasses--Starbucks Frapuccino bottles--with the cutest paper straws from Cakes and Kids Too. The menu was a mix of savory and sweet tea party bites. All in shades of pink and yellow, of course! 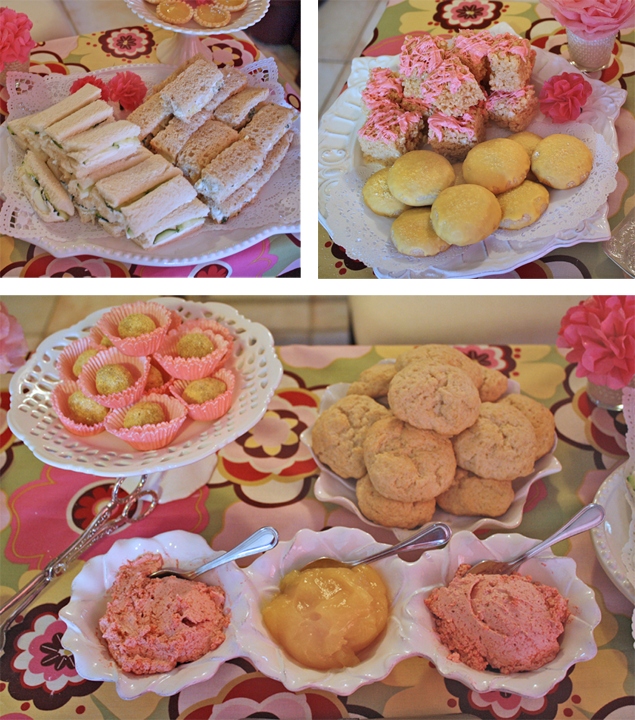 We munched on cucumber and cream cheese sandwiches, artichoke mascarpone sandwiches, rice krispie treats drizzled with white chocolate dyed pink, shortbread cookies with lemon icing, lemon Jello marzipan and scones with lemon curd and strawberry butter. Our party beverage was strawberry lemonade. I HIGHLY recommend the strawberry butter recipe. I could eat scones with strawberry butter forevahhh! Check out my Pinterest board for more little details. So, that's the set up. Watch out for Part II of Beauty, Brains and Benefit!